JOIN ANYTIME TO PLAY FOR THE CHANCE TO WIN! 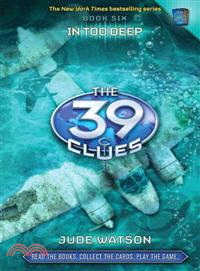 The 39 Clues gets treacherous. Book 6 takes Amy and Dan across oceans on the trail of a famous aviator, but they find more than they're looking for. Their enemies are becoming more vicious, and the truths they discover more crushing than ever. Jude Watson is the author of two 39 Clues books, BEYOND THE GRAVE and IN TOO DEEP, and the bestselling Star Wars: Last of the Jedi and Jedi Quest series. As Judy Blundell, she wrote WHAT I SAW AND HOW I LIED, the 2008 winner of The National Book Award for Young People's Literature. She lives in Katonah, New York with her husband and daughter.